OPI love their collaborations don't they? We have had Katy Perry, Justin Bieber and now there is a collection, released to coincide with the new Pirates of the Carribbean film. This is the most beautiful collection I have seen for a long time. I LOVE these kind of pastel shades. They are all creamy finishes and are rumoured to look better on than in the bottle. So today I hot-fingered(?) it (NOTE TO SELF: never use hot-fingered as an expression again - sounds very wrong) it over to my favourite ebay seller and ordered 5. The only one I exercised restraint for was Stranger Tides. The swatches online just made it look skippable to me - a sort of pastel sprout and well, I don't like the idea of that. 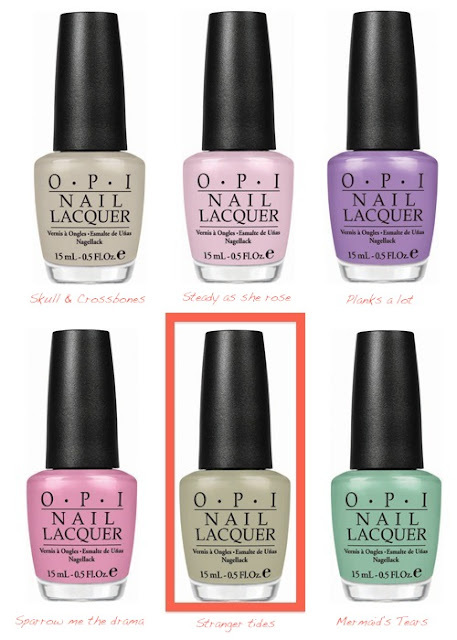 If you are not in the USA/Canada and you want to get your hands on these polishes then go to the link below - I have used this seller for about 3 years with no problems...although be warned, the prices seem to be going up! I have stranger tides is a nice colour almost kaki, i like it. I have this one of stranger tides in my collection. it is really nice.Well, I’m absolutely delighted I establish it and I’ll be bookmarking it and read-through back over and over again! Airport advertising in Surat is lucrative as well as exceptionally successful. Those behind airport media have plainly comprehended the significance and abused the advantages exhibited by out of home (OOH) advertising today.